My grandmother taught me to pick wild blueberries. On the lake in southern New Hampshire where we spent our summers, blueberries grew in the profuse underbrush. Picking them kept a bunch of active kids busy those long sticky days. Me, Charlot, Chris, Rolo and Annie followed the sandy road from our camp north to the neighbors’ yard where a narrow path led into the woods. The low bushes appeared in a clearing. We ate as many as we brought home. Perhaps this is why I enjoy collecting wild things like mushrooms and blackberries that grow not far from here. 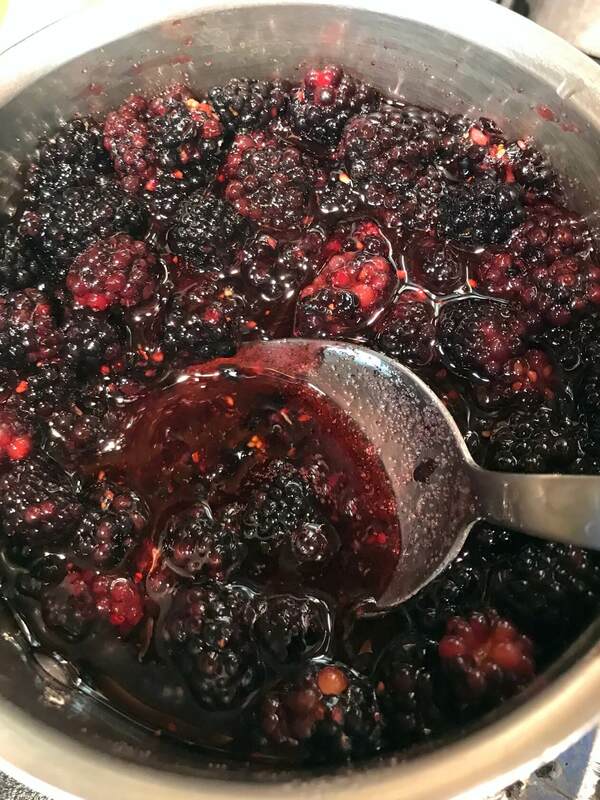 And turning the berries into wild blackberry preserves. Bending down, carefully spreading the branches to scout for spots of deep purple erases time. Bugs, sticky temperatures, it doesn’t matter. I wait for these weeks every summer when I can make one, two maybe even four tiny half pints of the seedy jam. 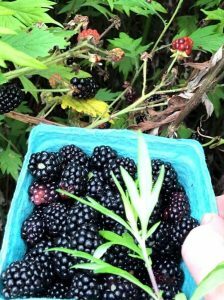 Sure, I could buy quarts of blackberries and raspberries at the farmers market. (Dondero’s has them at the Chester Sunday Market.) You know the saying “stolen meat tastes better”? That’s what motivates me. And these quiet moments in the lush green away from the screen bring me back to an easier time. 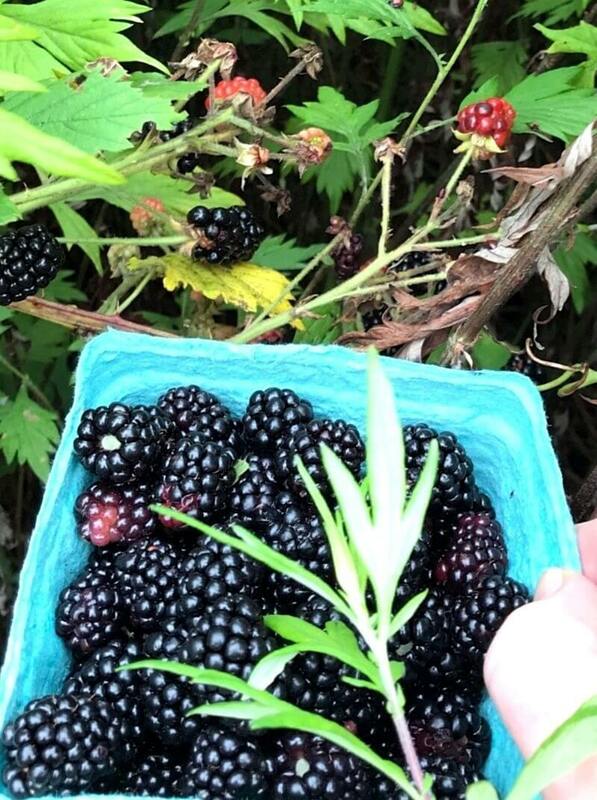 My spot where wild blackberries grow yielded a good crop this year. Here I am collecting the blackberries. 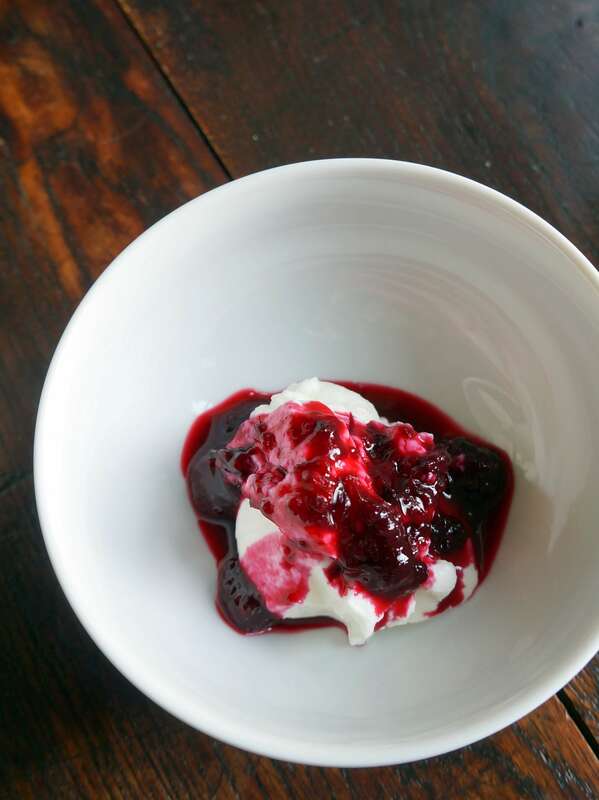 The secret to the intense flavor of wild berry preserves is to use much less sugar than normal. 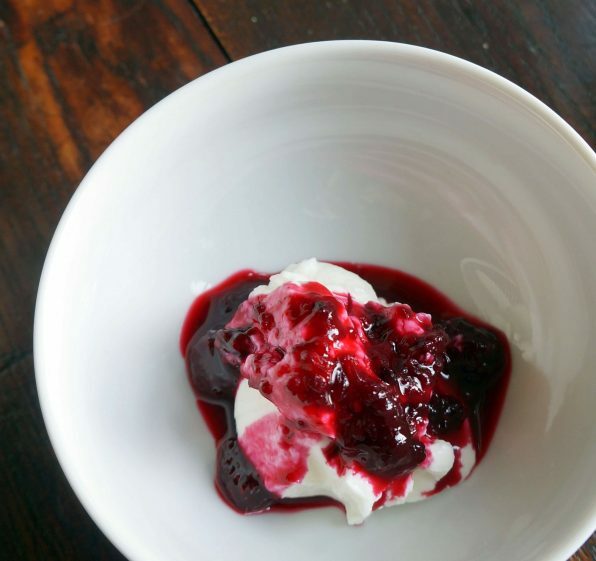 I use 75% less sugar than what you’d find in store-bought jam or preserves. It’s more like a sauce or honey in thickness. 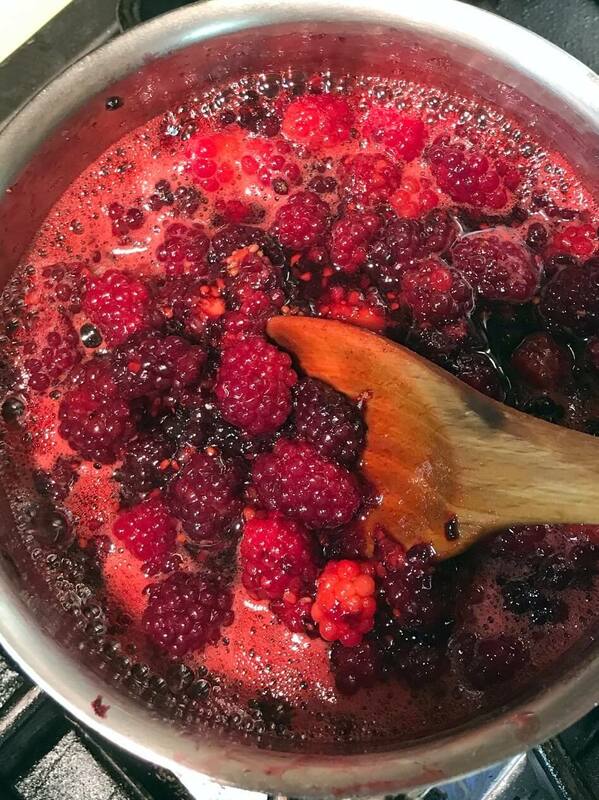 To make the preserves, you weigh the berries then use only 25% of their weight in granulated sugar. 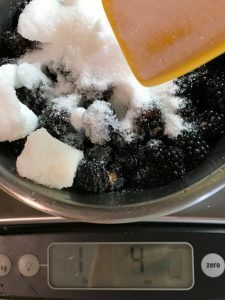 I mash the sugar and berries together to extract as much juice as possible before I cook the mixture because this reduces total cooking time. Less cooking time preserves nutrients and prevents scorching the fruit. The color of the berries changes from regal purple to magenta as they cook. You can skim off the foam or leave it. The intense color of the jam reflects its flavor. A little goes a long way to satisfy my taste for something sweet. Eat a raw green beans off the vine. Bring someone fresh wildflowers.Teach your kids to find a weed in the crack in the pavement. Show them your secret Fort in the woods. This loose berry preserve is almost a sauce. It contains 75% less sugar than conventional jam. Serve it drizzled over buttered scones or toasted English muffins the way you would honey. Or spoon over a scoop of ice cream. Dump the berries into a large bow and cover them with cold water. Swish the water around to loosen any leaves and bramble then let the berries sit in for a few minutes. Scoop out the debris that floats to the surface. Pull off any stems that cling to the berries. Lift the berries from the water and let them drain in a colander for about 30 minutes. Weigh the berries. Combine them in a stainless steel or glass bowl with 25% of their weight in granulated sugar. (For example, 1 pound = 16 ounces of berries x 25% = 4 ounces of sugar.) 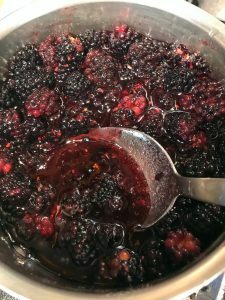 Stir the berries and sugar together in a dry bowl and let the mixture sit for 30 minutes until some of the berry juices are released. 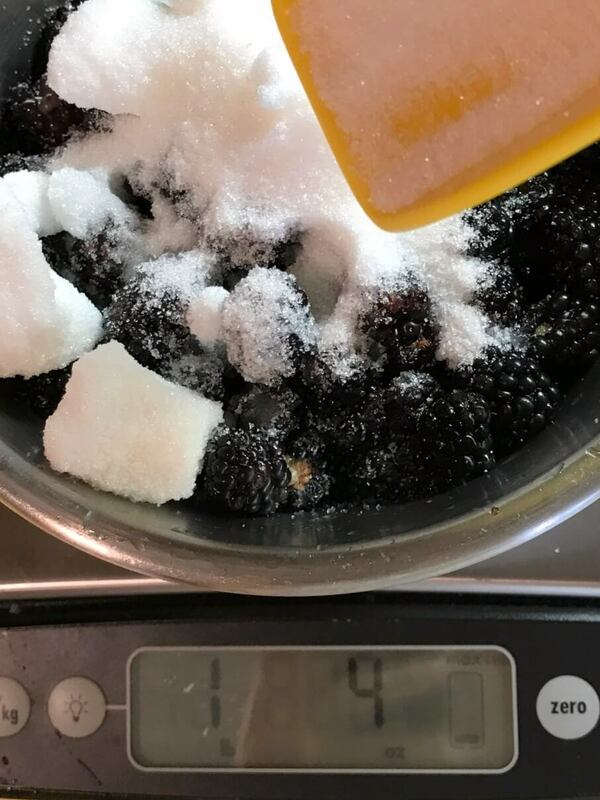 Place the berries and sugar in non-reactive saucepan. Add the lemon juice and bring to a boil, stirring constantly. Boil, stirring from time to time, for 4-5 minutes until the mixture seems thick and coats the back of the spoon. Pour the preserves into small, clean glass jars with lids. Store in the refrigerator for up to 2 months. Freeze for longer storage.